A young girl walks through a severely damaged street in Gaza. Secretary-General Ban Ki-moon today announced the formation of an internal inquiry aimed at reviewing “certain incidents” reported at United Nations facilities in the Gaza Strip during the recent summer conflict there between Palestinian factions and the State of Israel. During his visit last month to the war-ravaged enclave, the Secretary-General called for a thorough investigation into incidents where UN facilities – including schools run by the UN agency tasked with assisting Palestinian refugees (UNRWA) – sustained hits resulting in the deaths of numerous innocent civilians and UN staff members. The fighting – which raged from 8 July to 26 August – saw entire neighbourhoods in the Strip flattened, and almost one-third of Gaza’s population uprooted. The violence killed more than 2,100 Palestinians, including more than 500 children, and more than 70 Israelis while also damaging or destroying over 100,000 homes. The Board of Inquiry will be led by Patrick Cammaert of The Netherlands and will include Maria Vicien-Milburn of Argentina, Lee O’Brien of the United States, Pierre Lemelin of Canada and K.C. Reddy of India. 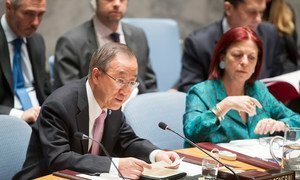 On the heels of last week’s visit to Gaza, United Nations Secretary-General Ban Ki-moon told the Security Council today that promises made at a recent donor conference on rebuilding the war-ravaged enclave must “quickly materialize” into concrete assistance on the ground, especially as winter approaches.